Somerset is one of the most relaxing counties in England with a variety of places to visit and things to do. From the soft coastline along the Bristol Channel going inland to the Somerset Levels which then rise to Glastonbury Tor and drop down to Wookey Hole. Weston Super-Mare has lovely beaches and plenty to do for the children. The many villages and towns all over Somerset offer lovely holiday cottages to stay and relax and explore Somerset. What Can We Do in Somerset? ‍Explore 60,000 years of history at the Wookey Hole Caves. Walk the Southwest Coast Path on Somerset’s north coast. Explore Bath’s stunning Georgian architecture and world heritage site. Hunt for fossils on rocky beaches north of the Quantock Hills. Watch an unrivalled range of live music at Glastonbury Festival. Visit the Elizabethan manor and gardens at Longleat. Meet exotic animals at Axe Valley Wildlife Park. Tour the compact cathedral city of Wells. Climb to the summit of Glastonbury Tor. Shop and sunbathe in the port resort of Watchet. See Europe’s largest naval aviation display at Fleet Air Arm Museum. Take a stroll in Tintinhull Garden, surrounding a 17th century manor. Hike to the Iron and Bronze Age hillfort of Cadbury Castle. Discover waterfalls and woodland trails at Ninesprings. Spend a day in the Blackdown Hills. Where Can We Stay in Somerset? Choose from one of the county’s many family-run bed and breakfasts. Enjoy a city break at a hotel in Bath or Wells. Pitch a tent in the countryside, or at Glastonbury’s famous festival. Book a somerset holiday cottage on Somerset’s hills, moors, coast or Levels. Somerset is a county in Southwest England, bordering Gloucestershire and Bristol to the north, Wiltshire to the east, Dorset to the southeast and Devon to the west. It has an area of 4,171km and is the seventh largest county in England, although its 508,000-odd inhabitants make it sparsely populated by most standards. Gently rolling hills, hedgerows, flat pastures and rugged moors make Somerset the perfect picture of rural England. The Blackdown Hills, Mendips, Quantocks, Somerset Levels and Exmoor National Park are all dominated by glorious countryside, while thriving cathedral cities and towns such as Wells, Bath and Glastonbury are packed with culture and popular bases for exploring the area. To the north, Somerset meets the sea with fossil beaches, harbours, towering cliffs and charming seaside resorts. This ancient land is scattered with historical landmarks, with 11,500 listed buildings, 523 ancient monuments, 192 conservation areas, 41 parks and gardens, 36 English Heritage sites and 19 National Trust sites. The Quantocks run for roughly 15 miles from the Vale of Taunton Deane in the south to Kilve and West Quantoxhead on the Bristol Channel coast, with oak woods, parkland, heath and fields to explore. The Quantocks were England’s first Area of Outstanding Natural Beauty, designated in 1956, and are a paradise for walking, cycling, horse-riding and wildlife-watching. Dramatic rocky bays and clifftops dot the coast, which is particularly popular among fossil-hunters, while inland, the hills are blanketed in heather, gorse and bracken. The region has an incredible diversity of rare birds, including tawny owls, barn owls, lapwing and skylark. Hike to the hilltops on a clear day and you will be able to see all the way to Exmoor to the west, Wales to the north and Glastonbury Tor and the Mendips to the east. The Mendips are another unspoiled range of hills, scattered with Iron Age hill forts and Bronze Age round barrows. The city of Wells lies on the edge of the Mendips with a stunning Gothic cathedral, fine medieval architecture and a lively centre, packed with independent shops and some of the region’s best restaurants. Nearby, the Wookey Hole Caves are a series of spectacular limestone caves with guided tours. Bath is also a must-see for visitors to Somerset, with exquisite Georgian architecture, Roman baths, natural hot springs and a Gothic abbey. Just to the north of the typical Somerset village of Cheddar, Cheddar Gorge cuts through the hills with a series of spectacular show caves, which are open to the public. There are plenty of opportunities to pick up the village’s best-known export, cheddar cheese, which is still produced here and matured in the Cheddar Caves. A small road meanders through the gorge, with stunning views of Exmoor and the sea. Climb the 274 steps of Jacob’s Ladder to the clifftop viewpoint, looking towards Glastonbury Tor and look out for peregrine falcons nesting on the cliff-face. At the southern edge of Somerset, near the Devon border, the Blackdown Hills Area of Outstanding Natural Beauty is home to steep ridges and valleys, high plateaus and springs. This remarkably unspoiled area is a paradise for walking and wildlife-watching, scattered with welcoming villages, ancient monuments and farms. 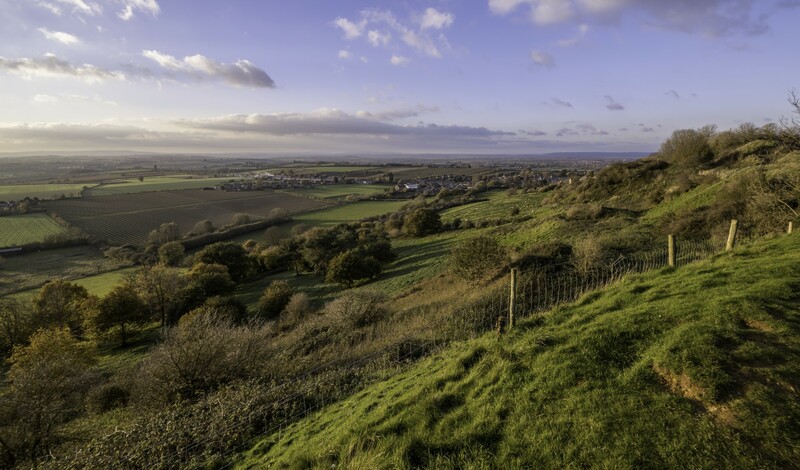 Stretching from the base of the Mendips and Blackdown Hills to the coast, the Somerset Levels and Moors is another expanse of tranquil countryside which is often overlooked by visitors. Somerset’s rugged north coast is home to secluded fossil beaches, ancient harbours, fishing communities and welcoming seaside resorts. Watchet is a charming harbour town on the eastern edge of Exmoor National Park, overlooking the Bristol Channel, with a historic port, bustling marina and quaint streets, packed with independent businesses. The Old English word from which ‘Somerset’ is derived meant ‘people living in or dependent on Somerton’. The market town of Somerton, in south Somerset, continues to thrive but is no longer the largest or most important town in the county. Somerset has a rich literary legacy. Much of Jane Austen’s fiction is set in Bath. William Wordsworth and Samuel Taylor Coleridge lived and worked in Porlock and Nether Stowey. Henry Fielding was born near Walton. Evelyn Waugh spent his final years in Combe Florey. And the ashes of TS Elliot are in East Coker. Somerset is shrouded in myth and legend. According to legend, King Arthur is buried in Avalon, the mystical area around Glastonbury, where the abbey is said to be the world’s oldest church. Joseph Arimethea apparently donated his tomb to Jesus and travelled to Britain to request that a church should be built by Glastonbury Tor. According to another legend, the village of Wookey Hole is haunted by the ghost of a witch who once cursed a man from Glastonbury who was betrothed to a local girl. An ancient track through the Somerset Levels known as the Sweet Track is thought to be the oldest engineered road to be discovered anywhere in the world. It is named after the peat-cutter who unearthed it and is believed to date back to roughly 3807BC. Somerset has many traditions, including the annual hobby horse ritual, on the night before May 1, when the horse dances through the streets of Minehead accompanied by musicians, tapping passers-by for money and lashing those who refuse with its tail. Farmer Michael Eavis started Glastonbury at his working farm in 1970, and it is now the biggest performing arts festival in the world. The globally popular activity of ten pin bowling is based on skittles, which originates in Somerset and is still played at many pubs, usually with nine wooden pins rather than 10. For centuries, Somerset has been famous for cider and there are still more than 30 farms in the county dedicated to its production. The term ‘scrumpy’ comes from a regional word meaning ‘small or withered apple’. How Do You Get to Somerset? Driving to Somerset from the rest of the UK is simple and often involves passing through some of Southwest England’s most idyllic countryside. Coming from the north, the M5 enters the county near Weston-Super-Mare before passing Taunton and Bridgwater. From the east, the A303 passes Stonehenge, Yeovil and Ilminster on its way to Taunton. From the south, the A37 crosses Dorset AONB from Dorchester, entering Somerset near Yeovil. The A39 follows Somerset’s north coast, through Exmoor National Park. And from west, the M5 and A30 enter Somerset near the centre of the county. It takes roughly two and a half hours to drive from London to Somerset. Coaches serve various destinations in Somerset, including direct routes from Taunton and Bath to London. Local bus services provide good connections to smaller villages and towns. London Paddington to Taunton is just under two hours by train with no changes. Direct trains to Devon, Cornwall and Bristol are available, with regular connections to the rest of the UK. Bristol and Exeter are Somerset’s closest airports, with various routes to Europe. Travellers from further afield may need to fly to London before boarding a train or coach to Somerset. Travellers from western Europe can also take the ferry from northern Spain or France to Plymouth in Devon or Poole in Dorset, both of which are a short drive from Somerset.